What's your promise to the public? 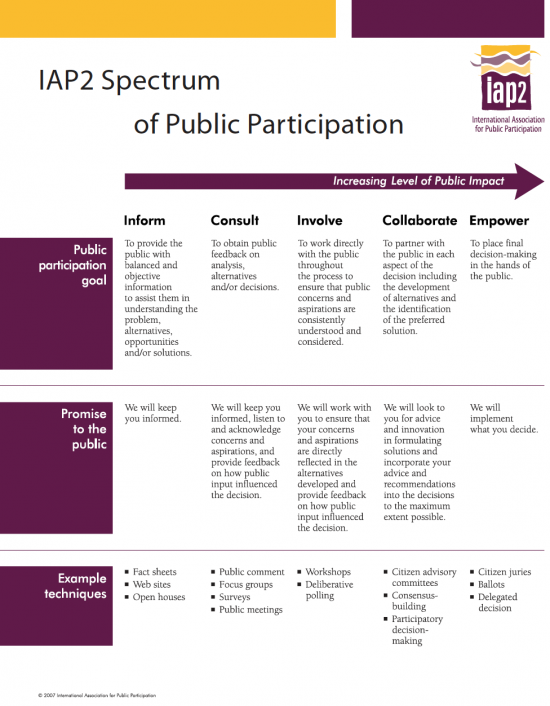 This tool really helps organizations, businesses or community groups that are looking for public involvement by encouraging them to think hard about their goals, the “promise to the public,” and then their engagement tools and techniques. Too many consultations rush ahead of themselves with tools and techniques before other considerations. “Let’s do a survey,” someone on a committee suggests, or “let’s empower people to help design a solution.” Those good intentions can go down in flames if the organizers haven’t thought through the goals and the nature of their public engagement. As the Spectrum clearly lays out in visual form, it’s not a good idea to throw around words like “empower” and “collaborate” if, at the end of the day, you have no real intent to allow your public to influence or choose a solution. Many public consultation projects are actually “inform and consult” operations, where the public influence is constrained. That’s not necessarily a bad thing. What’s bad is when we promise a higher level of involvement than we can really deliver. IAP2 (The International Association for Public Participation) is an organization of professionals (we belong) who want to contribute to effective public involvement. Making clear tools like the Spectrum available for public use is a great step in that direction.